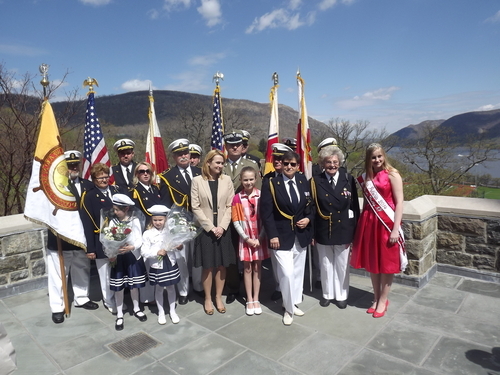 What follows are some of the highlights of this year's activities of May 2 and 3, 2014. 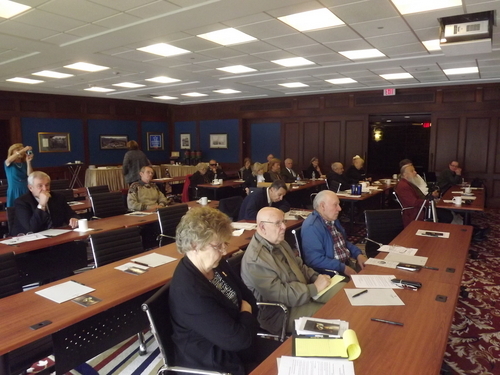 The theme of our 11th Annual Kosciuszko Conference had been "Tadeusz Kosciuszko, Poland's Constitution of May 3, 1791, and the Political and Security Climate in Europe from 1791 through the Congress of Vienna." Included after the end of the photos documenting our activities on May 2 and 3, 2014 is a brief retrospect on an AAFKWP event that occurred in Krakow, Poland on September 16, 2008. 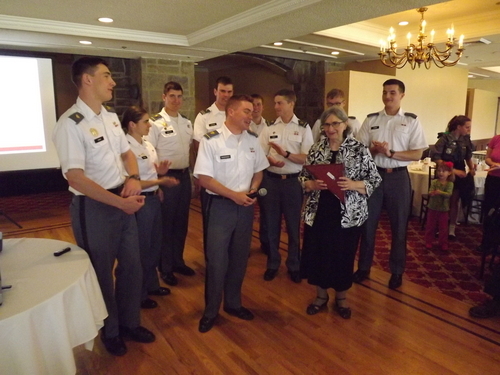 That event established the basis of a related event in Krakow in August 2014 involving the Kosciuszko Squadron of West Point whose members are Cadets of the United States Military Academy in West Point, NY. The separate and subsequent story -- "Retrospect (2008)" -- explores the historical AAFKWP antecedents leading to the Cadet members of the Kosciuszko Squad of West Point posing for the photo with their banner at the Kosciuszko Mound in Krakow in 2014. 11th Kosciuszko Conference Panelists: Dean Anthony J. Bajdek, AAFKWP President and Founder; Marijus Velicka, Vice Minister of National Defense, Republic of Lithuania; Professor Mieczyslaw B. Biskupski, Central Connecticut State University; Professor James S. Pula, Purdue University; Thaddeus M. Buczko, Judge and Colonel (USAR, retired) of Salem, Massachusetts; and Stephen N. Olejasz, Lieutenant Colonel (USA, retired), former Assistant Professor of History, United States Military Academy, West Point, NY, and AAFKWP Executive Vice President. 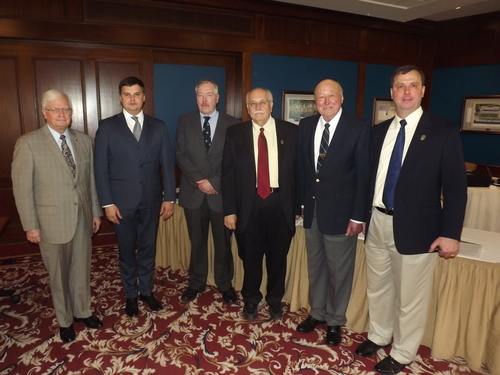 There were many photographs taken at the Conference that was held in the Eisenhower Room of the Thayer Hotel located on the grounds of the United States Military Academy in West Point, NY. For considerations of space, only a relative few could be included in this year's summary. Unfortunately, we did not receive a photograph of Professor Biskupski presenting his paper on the subject, "Foundations of Democratic thought in Poland from their origims through the Constitution of May 3, 1791." Along with our sincere apology, we guarantee that whenever he decides to be a presenter for one of our future conferences, we will capture him photographically for inclusion in a similar report of the Association's activiies for that particular year. The audience began to arrive in time for our 9:30 a.m. registration and 10:00 a.m. starting time. The Eisenhower Room in the Thayer Hotel is splendidly appointed for a conference, with very comfortable swivel-chairs, a million dollar view of the Hudson River, and all of the high tech audio-visual support for powerpoint presentations. The chairs-per-table seating capacity limits the number of conferees, so that one is well-advised to arrange to attend as early as possible. AAFKWP Founder and President, Associate Dean (retired) and Senior Lecturer in History Anthony J. Bajdek of Northestern University, Boston, MA opened the Confrence with a welcome and a powerpoint presentation titled, "The Perils of Rule by Divine Right in Europe from the 16th century through the eve of Poland's Constitution of May 3, 1791." Lithuania's Vice Minister of National Defense Marijus Velicka had been the presenter that attracted the thoughtful attention of his fellow panelists in the previous photo. 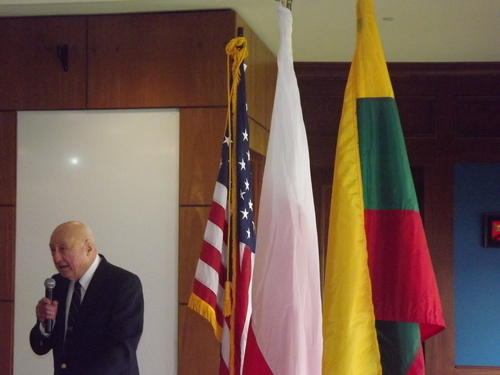 His subject had been, "Reflections on Kosciuszko and the Constitution of May 3, 1791 from the perspective of the Republic of Lithuania in the 21st century." 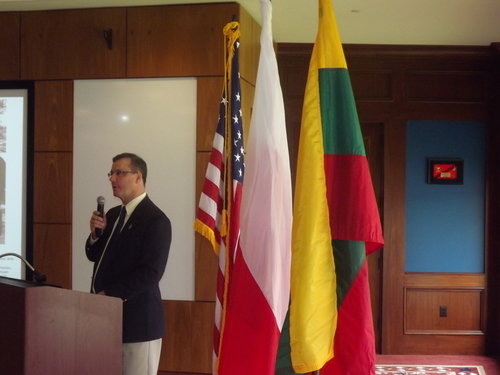 The flags of the United States, Poland, and Lithuania are always displayed prominently during our annual programs at West Point because Kosciuszko not only fought for the freedom and independence of the United States, but also subsequently for the freedom and independence of the Commonwealth of Poland and Lithuania. Very appropriately, therefore, all three fellow Republics are NATO allies in today's troubled and dangerous world. 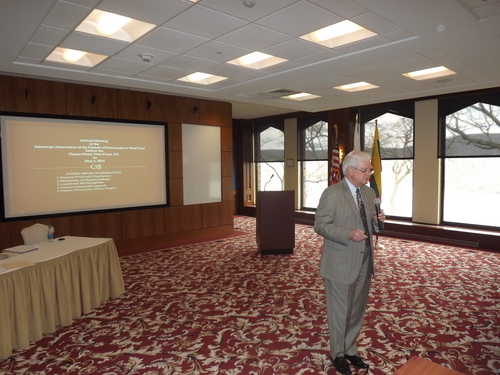 The Honorable Thaddeus M. Buczko, distinguished jurist, spoke on the subject, "Reflections on Poland's Constitution of May 3, 1791 considered from the perspective of an American jurist of Polish descent." Born in Salem, Massachusetts, he had served as an enlisted man in the U. S. Navy during World War II. Follwing that War, he graduated from Norwich University in Vermont with a commission in the U. S. Army. After serving in the Korean War as a unit tank commander, he graduated from the Boston University School of Law. His public serice began as a member of Salem's City Council, after which he served in the Massachusetts House of Representatives, then as State Auditor of the Commonwealth, Overseer of the Peabody Essex Museum famous for its early 19th century "China Trade" collection, and finally as First Justice in Essex County Court. Stephen N. Olejasz, AAFKWP Executive Vice President, introduced the afternoon's panelists and topics they would address, along with his insights into the matter of security in contemporary Europe, especially as it relates to America's NATO partners and allies, Poland and Lithuania. 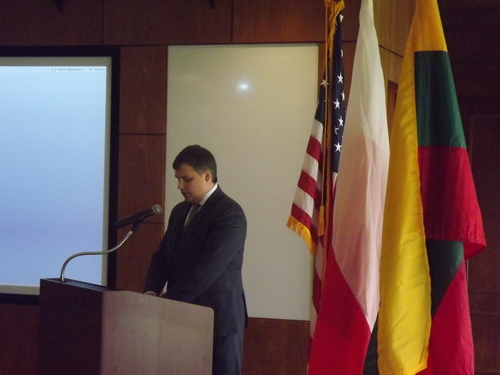 During his career in the United States Army, he had traveled to Lithuania in his capacity as Chief of Coalition Affairs Policy of the Pentagon's Joint Staff, thereby ensuring that he would be able to lend his own well-informed perspective on security issues confronting contemporary Lithuania and Poland. 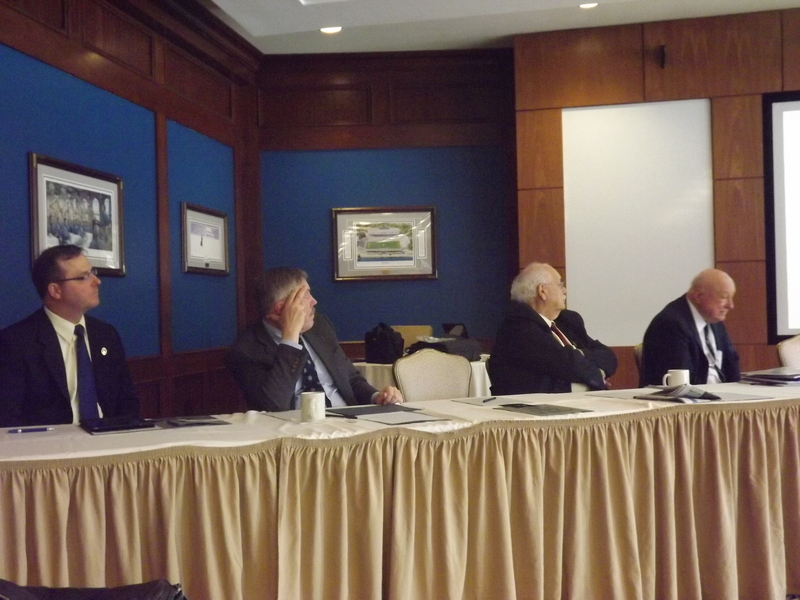 Following conclusion of the Conference, Dean Bajdek conducted an "Annual Meeting" for AAFKWP members only as required by its own By-Laws and the Commonwealth of Massachusetts, the state in which the Association had been incorporated on November 6, 2003. He emphasized that the Association continues to be a "work in progress" which in itself is a sign of good organizational health. Being a "work in progress" is a reflection that it continues to be a dynamic rather than static organization, one that is open to considering the best possible and original thematic structures for its annual venues. 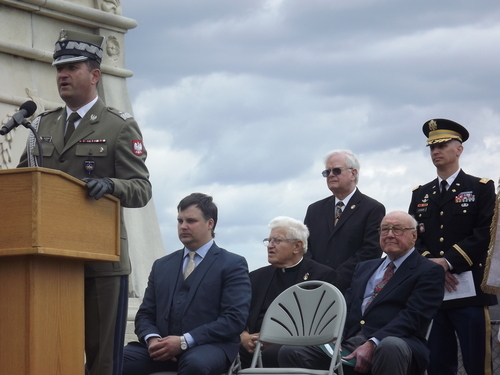 On Saturday, May 3, Brigadier General Jaroslaw Strozyk, the Defense, Military, Naval, and Air Attache, Embassy of the Republic of Poland, Washington, DC arrived with his wife and daughter to participate in four integral aspects of "Kosciuszko Day," those being the Kosciuszko Memorial Mass, the Review of the Corps of Cadets, the Annual Kosciuszko Observance at his Monument, and the Annual Kosciuszko Luncheon in the Thayer Hotel, all of which -- except for the Cader Review -- are organized by the American Association of the Friends of Kosciuszko at West Point. Brigadier General Strozyk, his wife, and daughter are pictured here in the center of this group photo outside the entrance of West Point's Cadet Chapel of the Most Holy Trinity, amidst loyal AAFKWP members of the Liga Morska (Sea League), and Miss Polonia. As planned, Brigadier General Strozyk delivered an address during the Kosciuszko Observance, as did Vice Minister Marijus Velicka, and Judge Thaddeus Buczko. The Reverend Carl A. Urban of Schenectady, NY delivered the invocation and had also served as celebrant for the Kosciuszko Memorial Mass earlier in the day. Although the clouds initially appeared ominous, the sun managed to break out again so that the weather was warm and dry throughout, all welcome ingredients for an outdoor ceremony. in recognition of her support for their student organization. 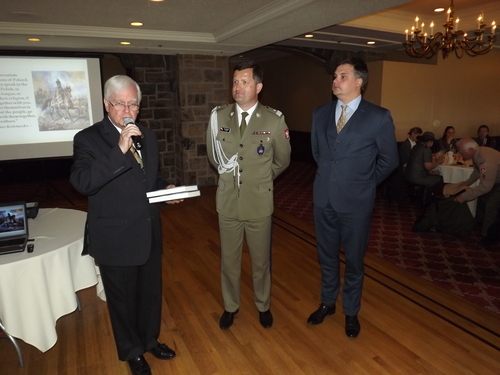 As the luncheon drew to a close, President Bajdek presented Brigadier General Strozyk and Vice Minister Velicka with copies of Francis Casimir Kajencki's 1998 biography on Kosciuszko, titled "Thaddeus Kosciuszko, Military Engineer of the American Revolution." Colonel Kajencki (1918-2008), a graduate of West Point, had been a founding member of the American Association of the Friends of Kosciuszko at West Point. 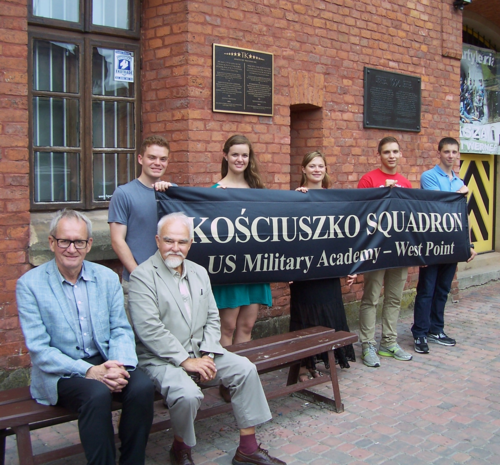 During the period of July 28 through August 8, 2014, six Cadet members of the Kosciuszko Squadron of West Point traveled through Poland accompanied by their faculty advisor, Professor Larry K. Mansour, Ph.D. Three of those days -- August 3 through 7, were spent in Krakow. 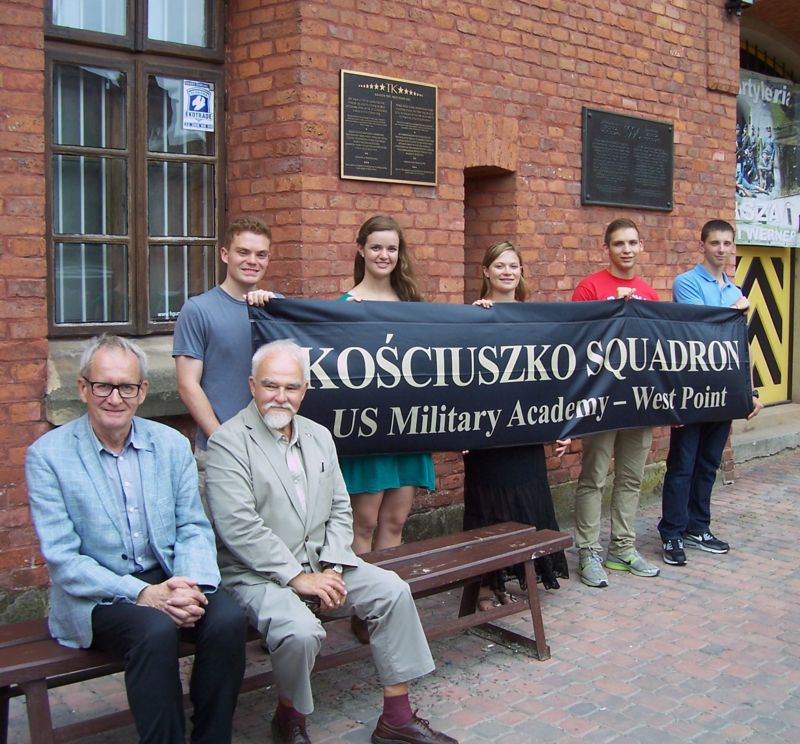 At the invitation of Mieczyslaw Rokosz, Ph.D., Professor of History at Jagiellonian University and President of the city's venerable "Kosciuszko Mound Committee" (Komitet Kopca Kosciuszki), they visited the Mound's associated Museum, and posed for this photo -- for which the sixth Cadet served as photographer -- with Professor Rokosz (seated second from left) outside the entrance, and directly under the plaque donated to the Museum in a ceremony on September 16, 2008 by Dean Anthony J. Bajdek, Founder and President of the American Association of the Friends of Kosciuszko at West Point. See this website's "Contact and Link Page" for further details concerning the dedication of that plaque. 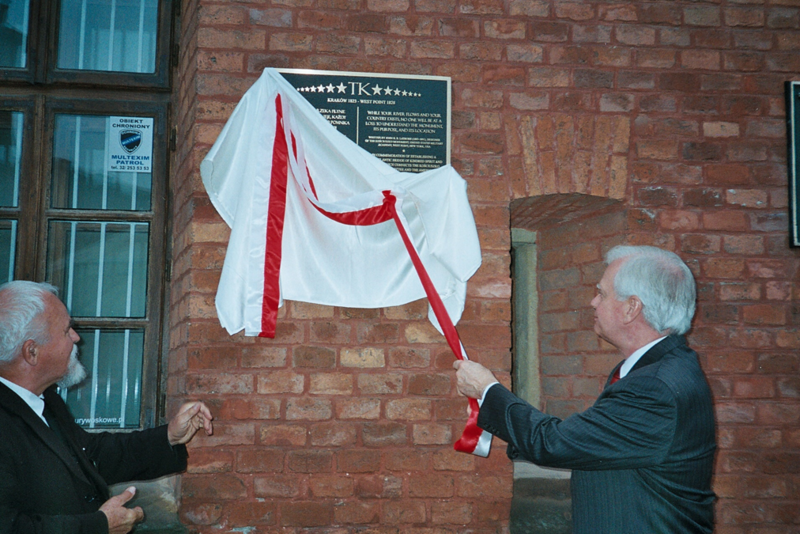 Click on "Sept. 16 plaque unveiling." In short, had it not been for the dedication of this plaque -- the gift of the American Association of the Friends of Kosciuszko at West Point to the Kosciuiszko Mound Committee (Komitet Kopca Kosciuszki) on September 16, 2008, there would have been no reason for the Kosciuszko Squadron to pose for this photo at this particular location. 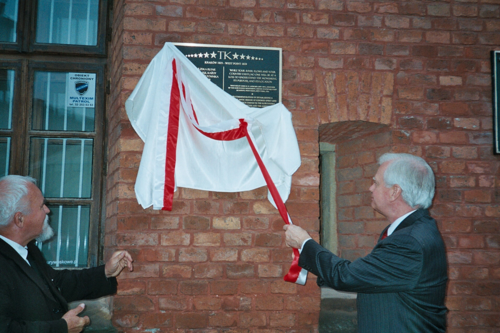 With Professor Mieczyslaw Rokosz here pictured on the left, this photo taken on September 16, 2008 captures the moment when Dean Anthony J. Bajdek unveils the above-referenced plaque (designed in Massachusetts, forged in bronze in Minnesota, and shipped from Massachusetts to Krakow, Poland). 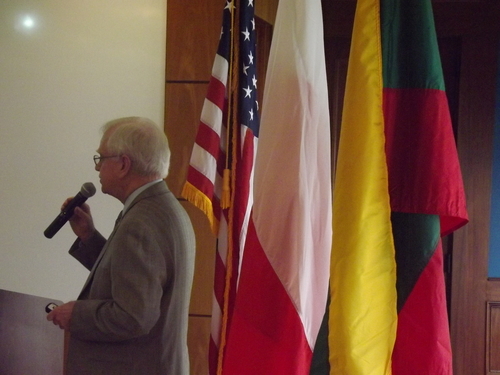 Not only had Dean Bajdek been invited to deliver a 20 minute address in Polish which he titled, "Jeden czlowiek, dwa kontynenty, dwa kraje, dwie demokracje, dwa pomniki, dwie rzeki i dwie organizacje" (One Man, Two Continents, Two Nations, Two Democracies, Two Monuments, Two Rivers, and Two Organizations) pursuant to the significance of the dedication, but also on the preceding day, as arranged as well by Professor Rokosz, he delivered an address in Polish of an hour and a half's duration, on the subject, "West Point i Swiecka Swietosc Tadeusza Kosciuszki we Czesnej Republice Amerykanskiej" (West Point and the Secular Sainthood of Thaddeus Kosciuszko in the Early American Republic).